A statue commemorating the works of war poet Wilfred Owen has been unveiled at Hamilton Square in Birkenhead. The sculpture marks the 100th anniversary of Owen’s death, who was raised in the town before dying in action aged 25, just one week before the end of the First World War. 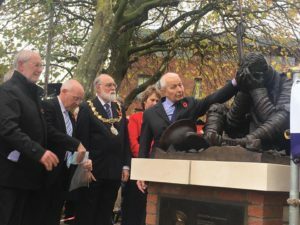 A small crowd of young people and war veterans alike gathered on Sunday to witness the revealing by Birkenhead MP Frank Field. Marc Jones, son of the artist who brought Futility to life in artwork was also there on Sunday. He said: “My dad’s drawing has been with me from a very young age. It was one of my favourites. No fewer than 600 men from Birkenhead were sent to fight in World War One. 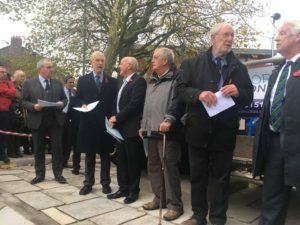 Members of the Birkenhead Old Boys Institute, where Owen was educated, read out a roll call for the 88 men who lost their lives all those years ago, in what turned out to be a very touching ceremony. Mike Wallis, 71, a spectator and local resident told JMU Journalism: “I’m extremely happy that the sculpture has been brought to Birkenhead. It’s a great way to mark Remembrance Day and to celebrate the works of Wilfred Owen. Other famous works by Owen, who died without knowing his eventual poetic legacy, include ‘Dulce et Decorum Est’ and ‘Anthem for Doomed Youth’.